Shaaanxo has teamed up with Pretty Buns Boutique to design the ultimate hair ties. Pretty Ties are handmade from soft elastic which won't dent your hair, our favourite thing is they match your bracelets on your wrist. You don't have to worry about black tight hair ties digging in anymore. Mix and match your 'xo hair ties' with your arm candy to suit your makeup and outfit, that way you can always have a hair tie handy. Shannon has hand picked and designed the 3 limited edition packs with you in mind, collect all 3. Amazing, cute and soo handy! Love!! Great! Really been enjoying these hair ties, ive been using them since i received my package! 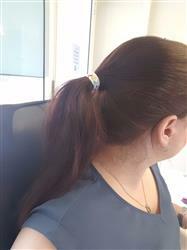 Only thing would be that my hair is really thick and its a bit of a struggle to get the hair tie to wrap around my hair the 3rd time, but i get it to work :) 2nd wrap would be too floppy for my liking. I love them! These are 100% the best hairties I’ve ever owned (and they’re so cute looking that I’ve never lost them like my normal ones) I have to have my hair up for work and everytime I take it out after work my hair is still so straight, its crazy. I will definitely buy them again, no doubt in my mind! !